"Radek paused, collecting his energies with an effort. 'Tatlin believes that this Hubble Effect, as they call it, is closer to a cancer than anything else - and about as curable - an actual proliferation of the the sub-atomic identity of all matter. It's as if a sequence of displaced but identical images of the same object were being produced by refraction through a prism, but with the element of time replacing the role of light.'" 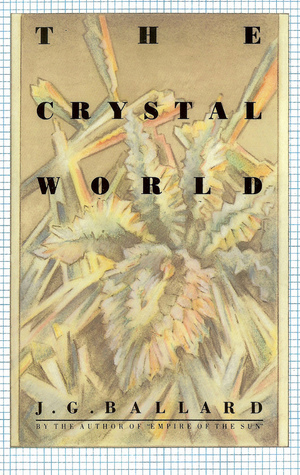 The Crystal World is the fourth of Ballard's novels, coming after The Wind From Nowhere, The Drowned World, and The Burning World. It falls within his science fiction period, coming before more abstract works and the more historically relevant Empire of the Sun. In the novel, a process of crystallization is slowly overtaking a patch of African jungle. Many of the characters within the story speculate as to the ultimate cause of this crystallization process, and what this alteration of the physical landscape might portend for their personal struggles. What is certain to all of them is that the process is irreversible. Comparing this book to both The Wind From Nowhere and The Drowned World, I'd have to say that it's a far inferior product. This is because it doesn't quite work in a dramatic sense, and also because the nonsensical scientific explanations for the crystallization process detract from a sense of verisimilitude that the novel would have otherwise possessed. Most of the events set outside of the crystallization process center around two separate love triangles, in which two men compete for the love of one woman, and two women compete for the love of one man. There is also a theme linking the crystallization process to leprosy, and this theme, which ought to have formed the backbone of the novel, is never explored in satisfactory detail. Yet the biggest weakness of this book is how it portrays the violent conflicts between various characters. These action scenes are incredibly disjointed, and it's hard to figure out what is going on exactly, or who's doing what to whom. While reading through these passages, I began to reflect on the fact that Ballard was never good with such scenes, and his books are better when he avoids them entirely. With all of the above said, The Crystal World is far from terrible. If you're working your way through Ballard's bibliography I'd recommend it, though only after you've read his more famous books. As for myself, I'll be on to either The Burning World or The Atrocity Exhibition soon.